If your child is under 3, unfamiliar with separation, or simply likes to start things slowly, our Integration Program is for you! Upon activation, new families will find the child(ren)’s 3 integration hours in the account ready to be booked, and we recommend using them one at a time, over the course of a week, or up to 10 days. These practice sessions prepare children for what they will experience when they stay for a longer visit. Including saying goodbye. And being picked up! Welcome to daycare. Plan to spend a few minutes helping your child settle in. Any of our animals, cars, the house corner, or building blocks are great activities that kids can start with parents’ help, and continue with a teacher or independently after you’ve said goodbye. Try to leave room for a teacher to join you. When you’re ready, let children know you’re going to go. Choosing somewhere they know about, like “work” or “Wholefoods” or “coffee” can help normalize this new experience. Let them know you’ll be back soon, and what you’ll do together when you return. Children’s integration visits are our first opportunities to create the relationships that will carry children through this new experience, and into a world of fun social engagement, and a whole new group of friends and people… but the kids don’t know that yet. Children look to parents for feedback, for assurance that the new situation is safe, and for your approval. Tell them it’s okay, with your words. Show them they are safe by pointing out their water bottle and comfort objects (if any), and give your approval by smiling and passing your child into the teacher’s arms. Find our handy how-to video on youtube! 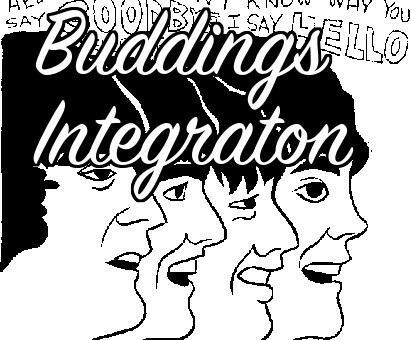 The goal of integration is to associate Buddings with fun and friends, of course, but also with a place that YOU come back to. Repetition is the best way we know to show your child that Buddings is a safe, fun place to play, and that parents always come back. Once they have that confidence, they can learn and play! Our Integration recommendations are based on courses and books by child psychologist Dr. Gordon Neufeld, about “bridging separation” and giving time in relatable terms.